Pool ownership is a big responsibility, but it doesn’t have to be. When you choose Green Acres Pool Place as your professional pool service company, rest assured your pool is in good hands. With more than 44 years of experience, our professional service and maintenance team is ready to take on the responsibility, giving you the time you need to do what’s most important – enjoy your pool. Green Acres offers a variety of routine service packages that will keep your pool and spa in pristine shape. We understand every pool and pool owner is different, that’s why we offer both weekly and bi-weekly pool maintenance packages that works for you and your schedule. Once we determine the level of pool maintenance you are looking for, we will be able to create a routine service schedule at a competitive rate. For the extra busy homeowner, we provide full pool service: pool cleaning, skimmer and basket emptying, water chemistry, filter cleaning, and periodic equipment checks just to name a few. Need a special one-time cleaning or a hand getting everything ship-shape after a storm or natural disaster? We can help. Just let us know what you need and we will be happy to give you a customized quote. No one ever regrets more time with their family, or simply finding time in their weekends for relaxation, so for complete pool maintenance, call in the experts at (Company Name). You will be glad you did! Old or damaged pool equipment can not only compromise the overall efficiency and safety of your pool system, but can also skyrocket your utility bills. 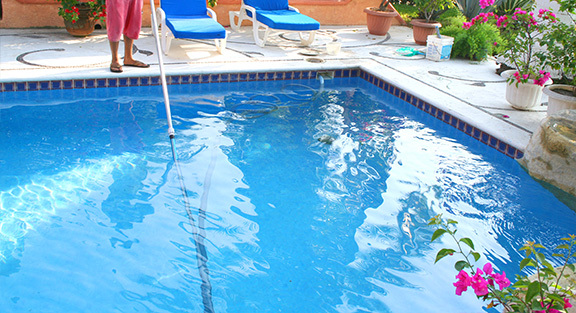 Our qualified technicians can repair or replace your pool equipment quickly and for a fair price. We’ll work hard to repair your existing equipment, and when a replacement or upgrade is needed we rely on the unsurpassed quality, durability, and efficiency of Hayward pool equipment to keep your pool at its best for years to come. We are a warranty station for Hayward pool products as well as Maytronics Dolphin cleaners. Contact us today to discuss your pool maintenance, servicing, and repair needs.